Centralization refers to the process in which activities involving planning and decision-making within an organizationCorporate StructureCorporate structure refers to the organization of different departments or business units within a company. Depending on a company’s goals and the industry which it operates in, corporate structure can differ significantly between companies. Each of the departments usually performs a specialized function are concentrated to a specific leaderLeadership TraitsLeadership traits refer to personal qualities that define effective leaders. Leadership refers to the ability of an individual or an organization to guide individuals, teams, or organizations towards the fulfillment of overall goals and objectives. This list of leadership traits will explain each one or location. In a centralized organization, the decision-making powers are retained in the head office, and all other offices receive commands from the main office. The executives and specialists who make critical decisions are based in the head office. Similarly, in a centralized government structure, the decision-making authority is concentrated at the top, and all other lower levels follow the directions coming from the top of the organization structure. A centralized organization benefits from a clear chain of command because every person within the organization knows who to report to. Junior employees also know who to approach whenever they have concerns about the organization. On the other hand, senior executives follow a clear plan of delegating authority to employees who excel in specific functions. The executives also gain the confidence that when they delegate responsibilities to mid-level managers and other employees, there will be no overlap. A clear chain of command is beneficial when the organization needs to execute decisions quickly and in a unified manner. When an organization follows a centralized management structure, it can focus on the fulfillment of its vision with ease. There are clear lines of communication and the senior executive can communicate the organization’s vision to employees and guide them towards the achievement of the vision. In the absence of a centralized management, there will be inconsistencies in relaying the message to employees because there are no clear lines of authority. Directing the organization’s vision from the top allows for a smooth implementation of its visions and strategies. The organization’s stakeholdersStakeholderIn business, a stakeholder is any individual, group, or party that has an interest in an organization and the outcomes of its actions. Common examples of stakeholders include employees, customers, shareholders, suppliers, communities, and governments. Different stakeholders have different interests, and companies often such as customers, suppliers, and communities also receive a uniform message. A centralized organization adheres to standard procedures and methods that guide the organization, which help reduce office and administrative costsSG&ASG&A includes all non-production expenses incurred by a company in any given period. This includes expenses such as rent, advertising, marketing, accounting, litigation, travel, meals, management salaries, bonuses, and more. On occasion, it may also include depreciation expense. The main decision-makers are housed at the company’s head office or headquarters, and therefore, there is no need for deploying more departments and equipment to other branches. Also, the organization does not need to incur extra costs to hire specialists for its branches since critical decisions are made at the head office and then communicated to the branches. The clear chain of command reduces duplication of responsibilities that may result in additional costs to the organization. In a centralized organization, decisions are made by a small group of people and then communicated to the lower-level managers. The involvement of only a few people makes the decision-making process more efficient since they can discuss the details of each decision in one meeting. The decisions are then communicated to the lower levels of the organization for implementation. However, if lower-level managers are involved in the decision-making process, the process will take longer and conflicts will arise. It will make the implementation process lengthy and complicated because some managers may object to the decisions if their input is ignored. The standardized procedures and better supervision in a centralized organization result in improved quality of work. There are supervisors in each department who ensure that the outputs are uniform and of high quality. The use of advanced equipment reduces potential wastage from manual work and also helps guarantee high-quality work. Standardization of work also reduces the replication of tasks that may result in high labor costs. Centralized management resembles a dictatorial form of leadership where employees are only expected to deliver results according to what the top executives assigned them. Employees are unable to contribute to the decision-making process of the organization, and they are merely implementers of decisions made at the higher level. Even when the employees face difficulties in implementing some of the decisions, the executives will not understand because they are only decision-makers and not implementers of the decisions. The result of such actions is a decline in performance because the employees lack the motivation to implement decisions taken by top-level managers without the input of lower-level employees. The organization’s executives are under tremendous pressure to formulate decisions for the organization, and they lack control over the implementation process. The failure of executives to decentralize the decision-making process adds a lot of work to their desk. The executives suffer from a lack of time to supervise the implementation of the decisions. It leads to reluctance on the part of employees. Therefore, the executives may end up making too many decisions that are either poorly implemented or ignored by the employees. Centralization results in delays in work as records are sent to and from the head office. Employees rely on the information communicated to them from the top, and there will be a loss in man-hours if there are delays in relaying the records. It means that the employees will be less productive if they need to wait long periods to get guidance on their next projects. Employees become loyal to an organization when they are allowed personal initiatives in the work they do. They can introduce their creativity and suggest ways of performing certain tasks. However, in centralization, there is no initiative in work because employees perform tasks conceptualized by top executives. It limits their creativity and loyalty to the organization due to the rigidity of the work. 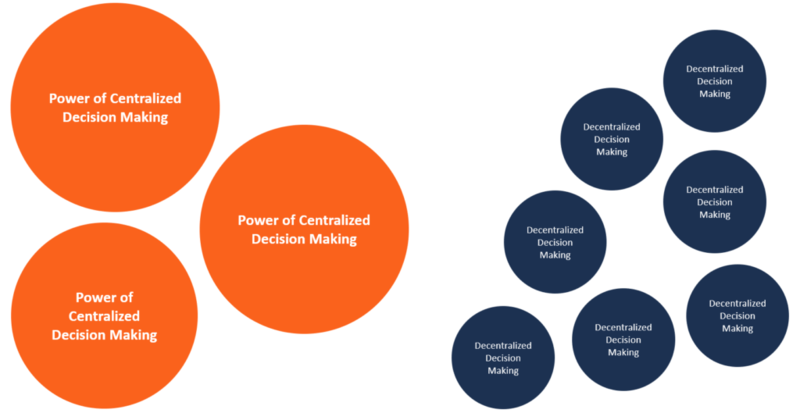 Centralization refers to a setup in which the decision-making powers are concentrated in a few leaders at the top of the organizational structure. Decisions are made at the top and communicated to lower-level managers for implementation.